This year, a very exciting opportunity presented itself. 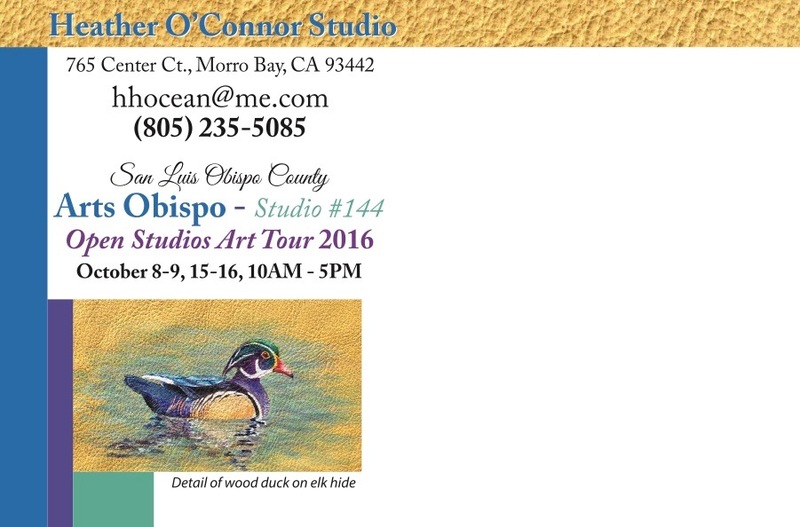 The ArtsObispo Open Studio Tour happens every October and I jumped at the chance. Word got around that I was new to this, so I was interviewed by Crissa Hewitt and Steven deLuque for our local PBS station KCBX.org. They are artists in their own right and were so nice to ask me questions that truly took me to the source of why I make pictures. You may listen live at 1PM Wednesday, September 7. To hear it later search my name (Heather O’Connor) at KCBX.org for the interview. You may take a tiny peak into my tiny studio… in the upper left corner ! A friend, Alyce Broome, is joining me in displaying our artwork. 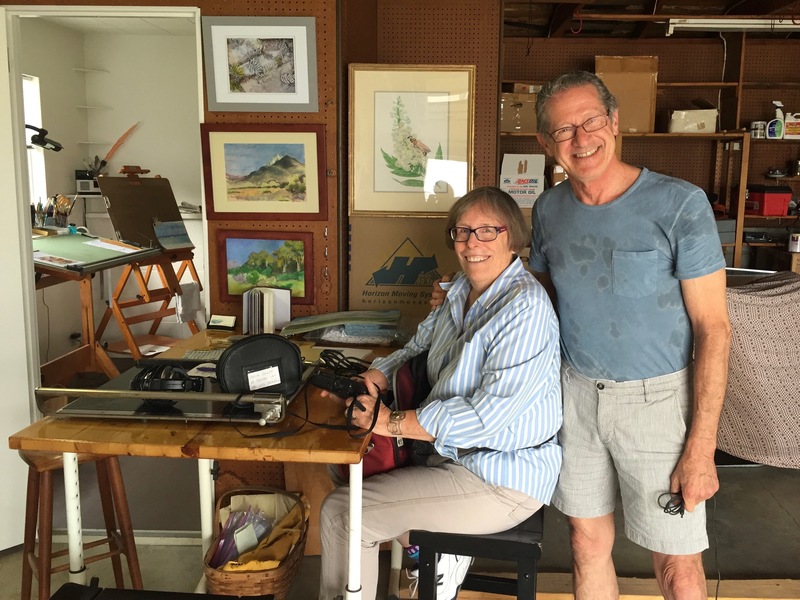 Her oil paintings are aerial views of the California landscapes. Just like a bird would see when flying over our planet! Visit both of our entries in the ArtsObispo Directory. Just enter Alyce Broome’s name or mine (Heather O’Connor) and you’ll find what we posted for this year’s tour. Be sure to click on my “orchid” to see my other entries. 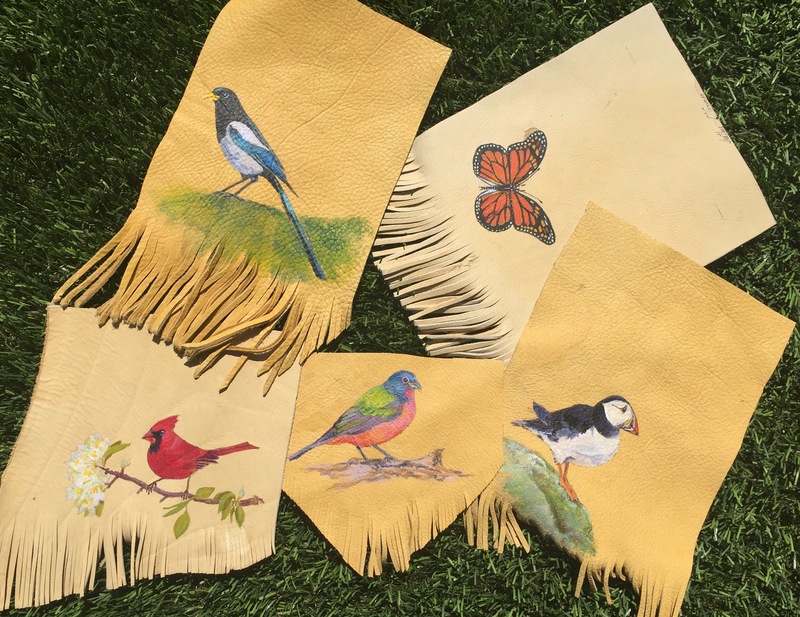 My acrylic bird paintings on elk hide will include 2 Common Loons, one with a chick on her back, a Painted Bunting, a Canyon Wren, and a Harlequin Duck. Others may be custom ordered and will benefit the Pacific Coast Peregrine Watch. 25% will go to a CalPoly Biology Scholarship. 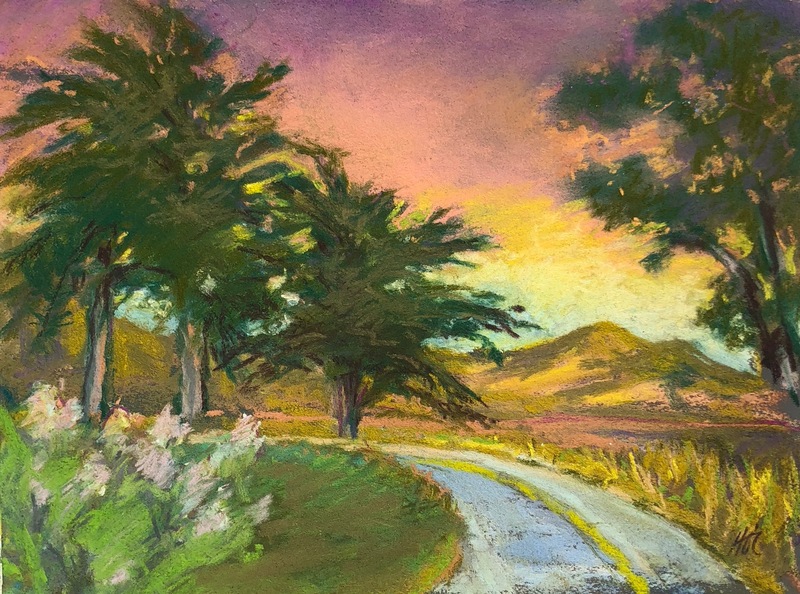 My pastels include a series of seascapes including marine layers, kite festival, rough winter waves and offshore views from Montaña de Oro CA State Park and landscapes of the Nine Sisters in springtime and gnarly trees of the California Central Coast. And please come visit me at my studio October 8-9 and 15-16, 10AM to 5PM. This summer has been quite delightful if you like fog. 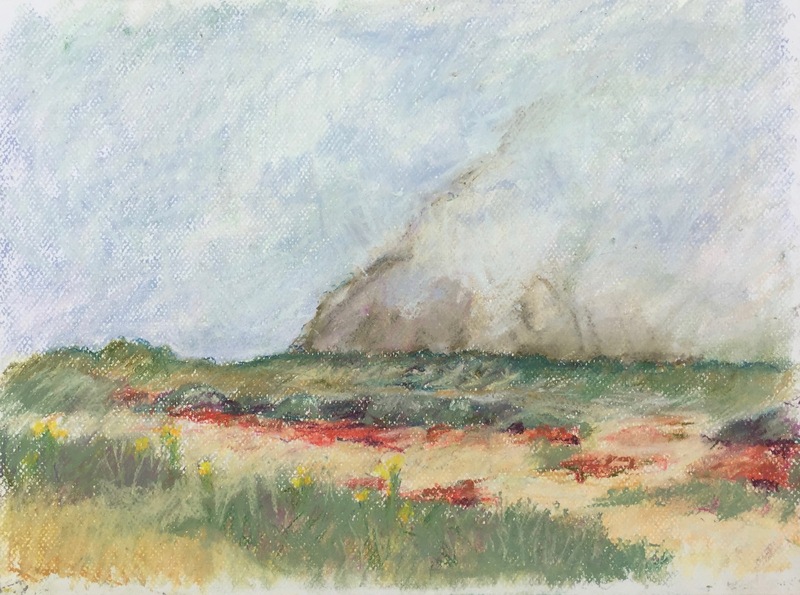 Growing up in New Jersey and Southeastern Pennsylvania, I did get to experience fog frequently, but it’s quite different here in Morro Bay, California. All summer long as the inland valleys swelter, the Pacific Ocean cools the Central Coast of California. Cold Pacific Ocean water and hot air over the land collide to produce vapors that hang around for at least a half a day. 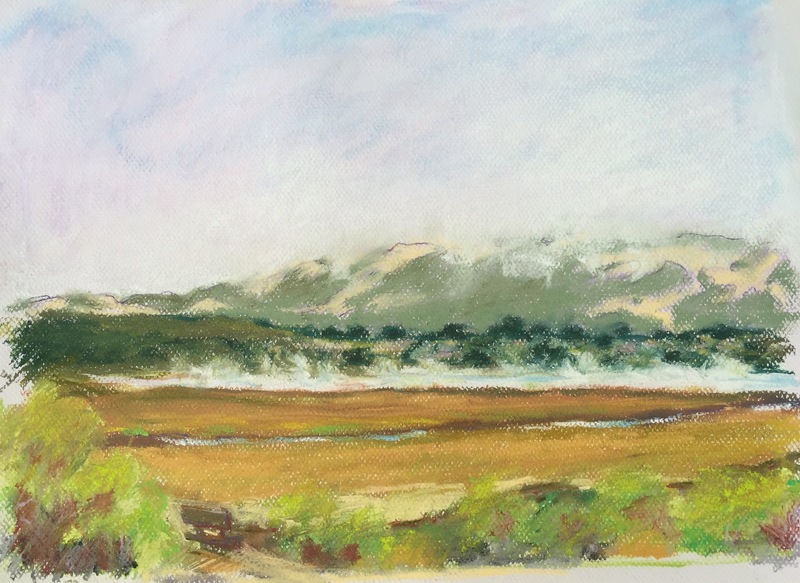 It sneaks fingers of soft white over the rolling hills, the Morro Bay Estuary and two or three of the Nine Sisters Peaks within a few miles of the coastline. It looms over Morro Rock like a halo or fluffy bonnet, but sometimes smothering it almost completely. Looking towards Los Osos over the bay, I saw cool air and warmer water colliding in the early morning making a very mysterious floating vapor that transfixed me for quite a while. 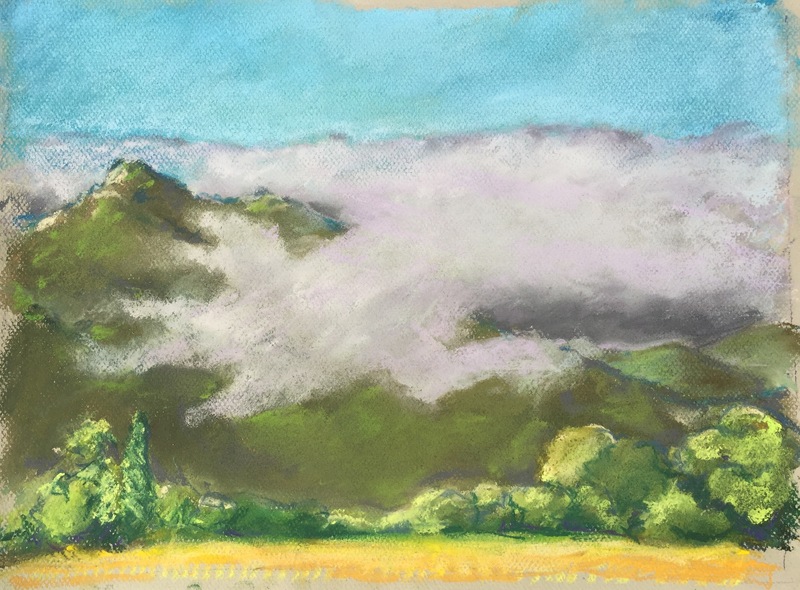 I just had to get my pastels to see if I could capture the vapors rising. In the distance, the landscape rose into more of the morning mists. 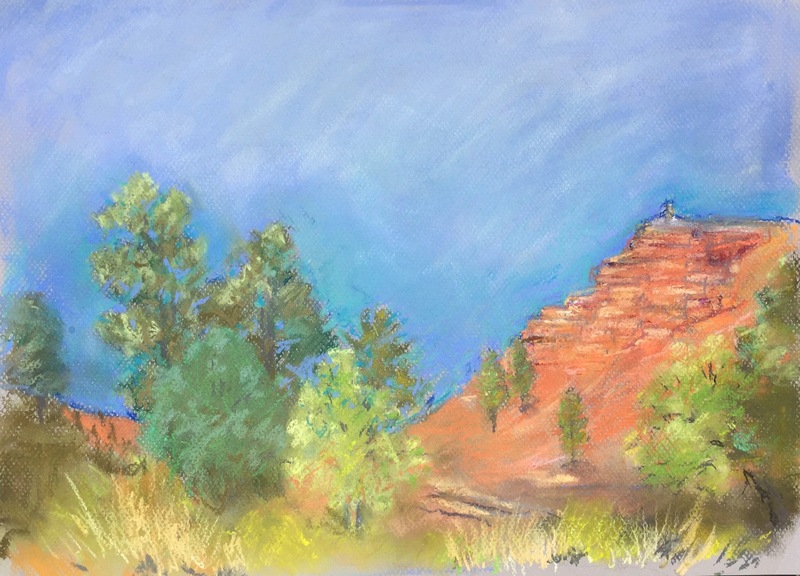 After visiting Bryce and Zion National Parks, I was on the way to see my son, Adam. He lives in Colorado ever since he left our family home in Bucks County, Pennsylvania. 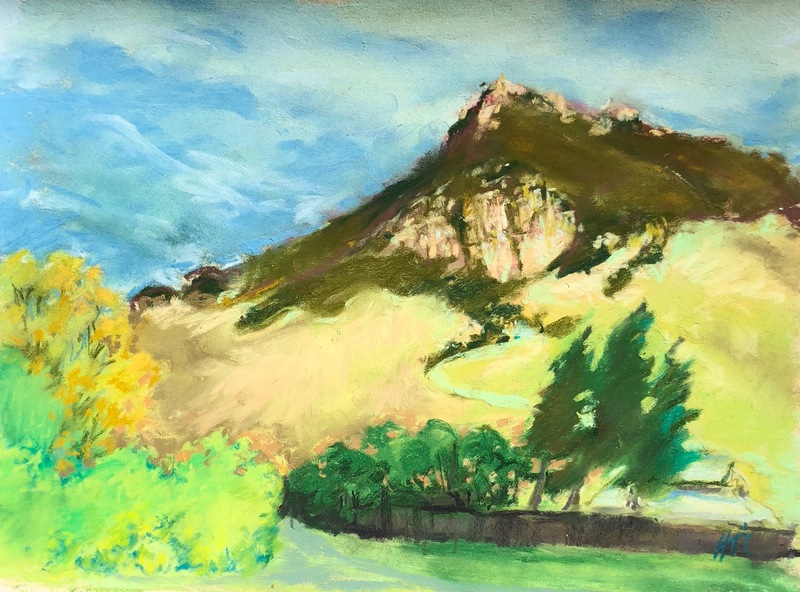 He has explored and lived on the Front Range, in Boulder and Lyons. Those were beautiful places, but the lure on snow country drew him westward so I followed to see what he’d gotten himself into. Snow, cycling, hiking and hunting activities were for him to explore while immersed in the grandeur of the Rocky Mountains. I got to visit often! The Flat Tops often seen with virga pouring from the high clouds. All is this is easily viewed from Adam’s house. This is his passive solar home on their 7600 foot mountain top where he, his wife, Rudy and daughter, Livia, live with views of Gambel’s oaks, Quaking aspens and Engelmann spruce before they see the distant mountains often with the alpenglow. 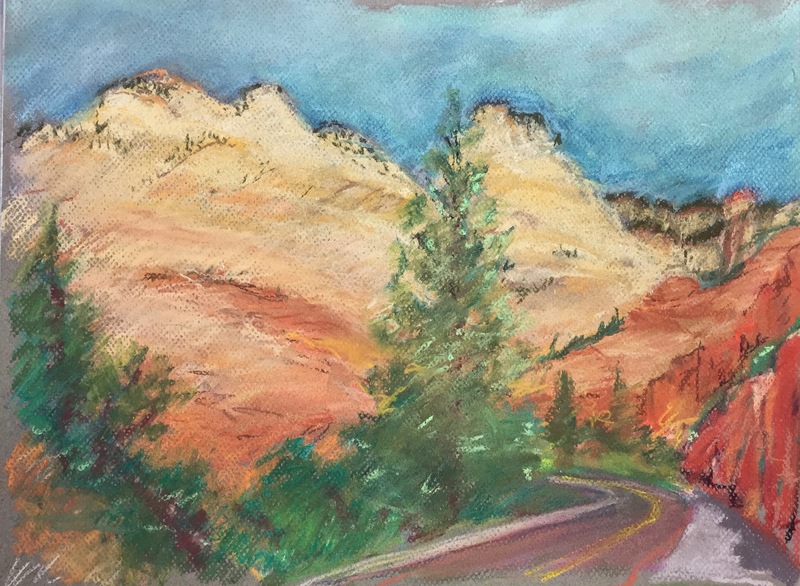 On a driving trip to visit my son in Steamboat Springs, Colorado, I saved time to visit Bryce and Zion National Parks. Weather going was delightful so I stopped briefly in Zion. On my return California, I went through a small colorful town settled in 1864 Panguitch, Utah ( http://panguitch.com ) and made a turn east to Bryce. 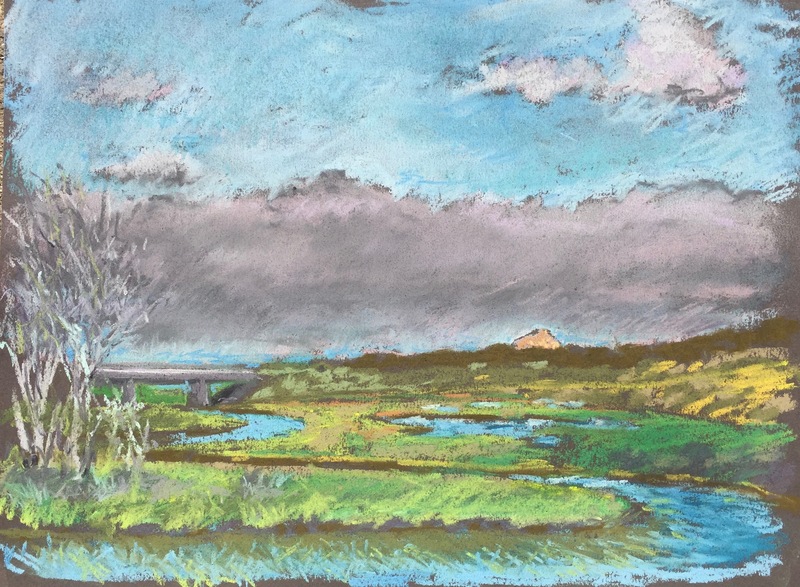 Definitely must go back to spend lots of time finding the best views for pastel paintings. Maybe Zion Lodge in the less touristed season would be suitable. It’s only 585 miles or 9 hours 22 minutes according to Mapquest from here!